Should You Worry About Artificial Flavors Or Colors? Should You Worry About Artificial Sweeteners? Should You Worry About Salt? Teflon and Human Health: Do the Charges Stick? Are "Low Dose" Health Effects of Chemicals Real? Denton, TX, birthplace of fracking, votes it off the island. So what? An op-ed in the pro-drilling blog site Natural Gas Now by Science 2.0 s Hank Campbell skewers the anti-fracking enviro s for their sheer hypocrisy. Ostensibly devoted to saving the earth and similar high-minded endeavors, the essay exposes the rampant agenda behind their crusade against shale drilling for tight oil in New York State s Marcellus shale deposits. Campbell points out that those marching in the streets demanding Don t Frack New York have zero evidence of fracking s ill effects, despite their outrageous allegations of toxic emanations into our drinking water and adverse health effects. However, while they assert their concern for Mother Earth and their neighbors who might have been afflicted with fracking s effects, they continue to eagerly use that same natural gas in their own homes and businesses. Where does this come from? Quite a lot comes from the frack-friendly southern neighbor, Pennsylvania. Do they care about those folks, exposed as many of them are to the dangers of fracking. Nah, not so much. What do wealthy progressives in New York and California share in common? Both groups are happy to exploit poor people as part of their self-identification. In California, that has involved not vaccinating their children, instead letting poor kids get vaccinated to provide herd immunity for their special snowflakes, while in New York it means adopting a veil of environmental sincerity, by going after both nuclear power and natural gas, while quietly buying all the fossil fuel energy they can get to prevent brown-outs. Let poor people in Pennsylvania have health risks, say New Yorkers. The environmental lobbyists who control the New York Department of Environmental Conservation yes, there is a state department devoted to being against science issued the final report of a seven year study whose conclusion was preordained; fracking is bad, they said. Meanwhile, another part of New York government is preparing to buy energy they will need from over the border in Pennsylvania, which will come from ¦fracking. Because activists also want Indian Point nuclear power closed this summer and they cannot meet their energy demands without Pennsylvania fracking. ACSH s medical director, Dr. Gil Ross, had this comment: The fringe anti-fracking zealots have managed to seize control of the New York State government, taking Gov. Andrew Cuomo, Health commissioner Howard Zucker, and Enviro chief Joseph Martens into their bosom, keeping Appalachia fixed as in amber in the rust-belt 20th century, while Pennsylvanians reap the rewards of vigorous shale gas extraction. And why? Because a few wealthy progressives fear the encroachment into their precious manorial enclaves all warm and toasty thanks to the natural gas they claim to despise of the drilling technology safely and economically utilized in at least twenty other states. Banning the practice was, according to Dr. Zucker, based solely on concerns of safety: the precautionary principle, not on any actual documented dangers. But in fact, that whole Health Report had been written for Cuomo years ago by his green base, devoted to getting rid of fossil fuels by any means necessary. When the former health commissioner, Dr. Nirav Shah, declined to cooperate with Cuomo and Yoko and Josh Fox, he got the ax and Zucker endorsed the ban. So the people of New York suffer the consequences. 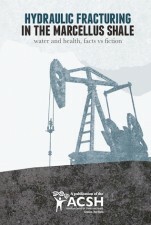 For the lowdown on hydraulic fracturing/fracking, see ACSH's report here. ACSH in the Media: Scientific American, Stossel, Forbes, and More! ACSH in the Media: Across America and Around the World! We are funded mostly by readers like you. Please consider donating! "Big Fears Little Risks" is a documentary, but unlike most of what you see on places like Netflix, it is pro-science, and not scaremongering trace chemicals, food, or the modern world. We instead are going to take back the discourse from trial lawyers and the trade groups they use to profit from fear. But it is a donor-funded program, and we need your help. We are 70% of the way to having it fully funded and if you can help get us over the top, please do so here. How Do Doctors Spend Their Time? ACSH in the Media: From Sea to Shining Sea and Beyond! ACSH in the Media: Newsweek, Snopes, Doximity, and More! AAAS Runs Dishonest Glyphosate Story, Then Deletes It. Is Politics to Blame? UK Parliament Endorses E-Cigarettes to Help Smokers. Will U.S. Follow? The American Council on Science and Health is a research and education organization operating under Section 501(c)(3) of the Internal Revenue Code. Contributions are fully tax-deductible. ACSH does not accept government grants or contracts, nor do we have an endowment. We raise our funds each year primarily from individuals and foundations.